Customized Mechanics – How Strong & How Fast?? How strong do you need to be to throw a baseball really, really hard? This is a tricky question to answer since there are a lot of factors at play. For example, I mentioned way back in the antropometrics article that you wouldn’t expect Aaron Sanchez to lift the same amount when bench pressing or squatting as you would Marcus Stroman due to their obvious physical differences. To make things even more complicated the type of strength seen when lifting the max amount of weight with squatting or bench pressing represent only one of several types of strength that can be used to throw a baseball. So in order to try to answer this question of how strong and what kind of strong you need to be to throw hard we’re going to first have to learn about these different types of strength. This article will undoubtedly just be the first part of a 2-3 more discussing this part of the physical profile. The goal of this intro article is to help paint a clear picture about the different types of strength. As you make your way down the list on my profile the weight being used gets lighter but the speed of the movement is faster which is seen here in a force-velocity curve. This 1102lbs deadlift seen below by strong man Eddie Hall would represent the extreme left side of this curve which takes about 6 seconds to complete. The arm action of an Aroldis Chapman fastball with a 5 ounce ball would represent the other extreme. But notice how I said that its just that final portion of the pitching delivery that’s going that fast. If we were to focus on the first part of the delivery, where the rules states you have to start from a complete standstill (rule 8.01), you would be looking further to the left when we try to get our entire body moving towards home plate with off of just one leg. So its important to look at the whole force curve to see how we can transition our way from the left to right as you deliver the ball. I’ve used the race car transition analogy in the first article that started this series about customized mechanics over a year ago. Check it out here. To expand on this analogy a little more think of pitchers like as drag race cars. They too must start from a complete standstill in 1st gear (max strength) then hit all the other gears along the way to max velocity like we see from the inside of the drag racer below shifting gears. Pitchers do get the benefit of using a sloped mound which helps them get a rolling start which is why not every hard thrower you see out there has a good 1st gear. The pitching delivery is really all about how you “shift gears” to maximize your top end speed when you release the ball. But its also really important to see how fast we can go in each gear because you could be the best gear shifter in the world but if you don’t have any horsepower its relatively useless. How Powerful Are Your Gears? 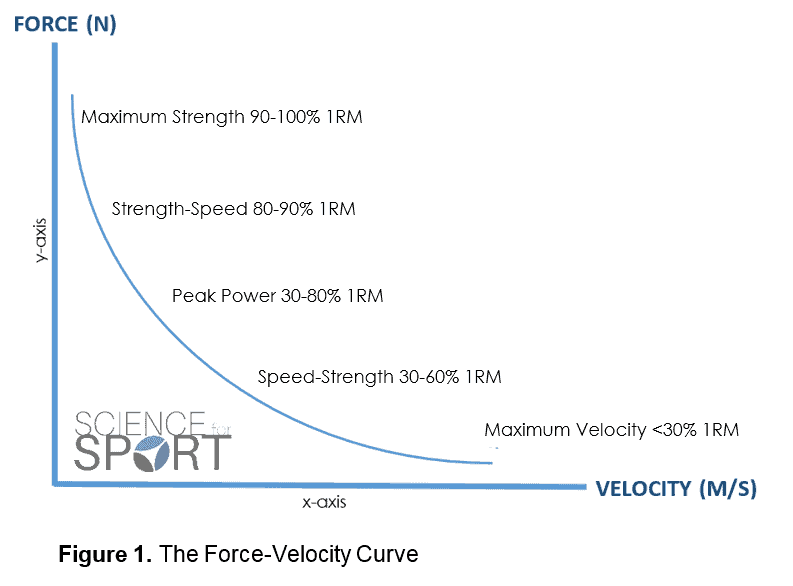 Determining how powerful (force x velocity) a player is at different points along the force curve isn’t that easy since we have to know how fast (velocity) the weight (force) is moving in order objectively and accurately determine the amount of power being produced. Measuring the force is as easy as adding up the weight on a barbell but measuring the speed is a bit trickier since radar guns don’t do a great job of measuring barbell speed. Fortunately there has been an influx of affordable and accurate devices like PUSH which do allow us to measure the velocity. The baseball world is obsessed with the velocity and our ears always perk up when we hear the “V” word. Here is what that curve looks like when we use velocity to categorize the different types of strength. Just as a reference a 99 mph fastball is moving about 44 meters/second (m/s). Everyone has these gears but to be powerful its all about how much weight can you move at each speed. Finding out how well a player does in each category I think this is important because it can help us provide better training in the gym and advice/coaching cues for the mound. There has been a recent surge in the strength and conditioning world with the use of what’s called velocity based training (VBT) because it has been shown to help deliver results. Dr. Bryan Mann from the University of Missouri has been leading this charge of using velocity to help develop better training methods. Dr Mann noticed that when he was training the football team the vertical jump scores did not improve when they used the heaviest loads while performing hang cleans. The use of the heavy loads was at the request of the football coaches since they thought that this was important and wanted everyone’s hand clean max’s to go up. The speed of the lifts when using these heavier loads was just too slow in the range of 0.6-0.8 m/s whereas jumping is a lot faster (1.4 m/s). The next semester the focus shifted to bar speed rather than weight. When the athletes had to meet the minimum requirements for speed when performing the hang clean the results for vertical jump scores were much higher. This isn’t to say that working at lower or higher speeds doesn’t provide any benefits but it does highlight the principal of specificity. If you want to learn more about VBT check out this great article by Jack Scheideman at Driveline or click here to read an article that Dr Mann wrote. That will do it for the first article about the strength portion of the physical profile. Next I will cover the individual types of strength starting with the heaviest and slowest part of the curve. Awesome article and just a great tease. I can’t wait for the third installment. This has me scurrying back over the first installment and the recommended readings. Thanks for your continued work. Conditioning for Baseball That’s Not Running Poles!! !